After collecting 100 Racks in one day with some innovative independent grinding, selling 1,000 hard copies for a whopping $100 each to his die hard fans. Nip releases the DJ Drama backed project for free available at Datpiff. Crenshaw features fellow LA independent grinders Dom Kennedy and Skeme also the MMG captain Rick Ross who sent cases of Belaire Rose to Nipsey’s Pop Up shop on Fairfax, where he personally handed out the project to his fans. Those willing to shell on a C note for the CD which came number/singed and with a ticket to his show coming up in November got a complimentary glass of Belaire while waiting in line. That’s not the only boss in the game that supported Nipsey’s movement Jayz dropped 10,000 and bought 100 copies. 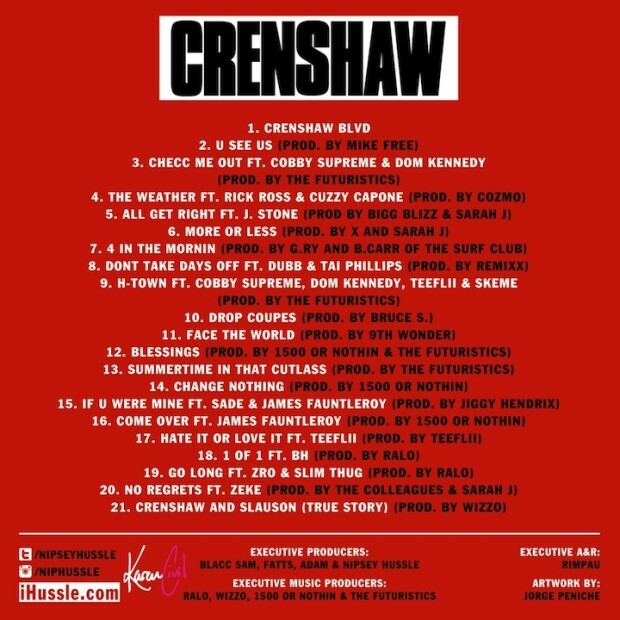 Crenshaw also features production by 9th Wonder, The Futuristics and 1500 or Nothin support the grind and cop it from Nip’s Store on Crenshaw and Slauson in LA or DL for free above.